Norwegian Olympic Champion ice skater Sonja Henie was a petite blonde who rapidly became one of Hollywood's highest-ranking movie stars after her first two films struck gold for 20th Century-Fox, whose studio boss Darryl F Zanuck had placed her under contract. 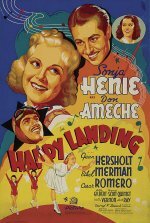 This was her third smash Fox feature, in which the winsome Henie enjoys the company of two leading men and a nothing plot about a bandleader's plane landing near Henie's house in a very Hollywood Norway, hence the title. But plots don't matter when Sonja skates, Ethel Merman sings, and the two guys are amiable Don Ameche and handsome Cesar Romero. The film's easy to watch, undemanding, and deceptively highly-skilled entertainment, but Sonja connoisseurs avow that the score's not so hot as in other Henie vehicles.